Club Penguin Cheats by Mimo777 Club Penguin Cheats by Mimo777: Club Penguin Field Ops Stamps! If you are wondering why you you have not earned the 5 and 10 medal stamps, that is because you have used your medals to get elite gear. 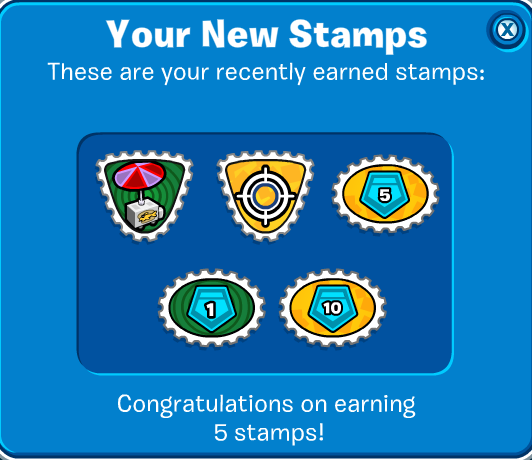 For some reason, Club Penguin will reward you with stamps if you save your medals up. Hmm, I guess this is one thing non-members can earn more easily than members since they can't buy elite gear, right? What do you think about earning stamps for Field Ops? Will it make you want to keep up with the same puzzles week after week? Are you going to start saving your medals to get those stamps? How did you get five medals and ten medals? I just got one stamp for completing today's field op. Congrats on new stamps! Happy Stamp-EDEING! Oh, I just realised. It must only count your current total of medals, not your career total. So that means I have to go like a year without spending my medals. Oh wow. That's annoying. Oh, cool. But I don't really like it that we have to save them for like a year to get just that 50 Medal stamp. Mimo must not of bought any of the EPF items for sale. So he still has all the old medals he has collected in the past. Happy Stamp collecting! It's going to take a while to get all of these new stamps though. Cool. I spent all my old ones already so when I did the Field Op and got the stamp I was like, ''What?'' lol. I know. I want to spend my medals on stuff but I have to save them if im ever going to get the stamps. ya it will take forever! I knew that it would pay off to not use my medals! I'm glad I saved up. hey mimo did you also know that in the games section theres a mission section? if you didnt plz mention katiedid898 and say thank-you. Ya, I remember Mimo doing a post about that. Thank you though! You might have spent them on the elite gear, like Mimo said, this is one thing non-members can do easier than members! Mimo got it because, he was probably saving the medals up. Woot! They should have more of these stamps. it will take you 11 months and 2 weeks to finish it if you dont spend any. Did you get any new onez? I did! And yeah, that stampEDE was a pretty awesome party! But back to the subject, why does jello not jump rope...? Yup! Saving up is a good idea! I couldn't find anything I liked, so I just decided to. :) Hope you get lots of medals! Oh yeah! That is a really good one! Maybe you could email Club Penguin and tell them to make that! There is? I think Mimo knows that already, because he is the MASTER of all stamps! But I surely didn't! Thank you very much katiedid! Dude, seriously?! That's SO cool! Lucky ducky... I've only seen him at his parties! But please, don't use caps! Mimo won't be able to post back if you do because his ears are hurting so bad! Yeah... I don't want to do the math, but that is a LONG time... Almost as long as my super giant ultra size gummy worm is! how did you get the food stamp??? I'll be saving up from now on :) Well done for getting so many mimo!! Mimo how do you do the throw a snowball at a target 50 times and the serving food one?? 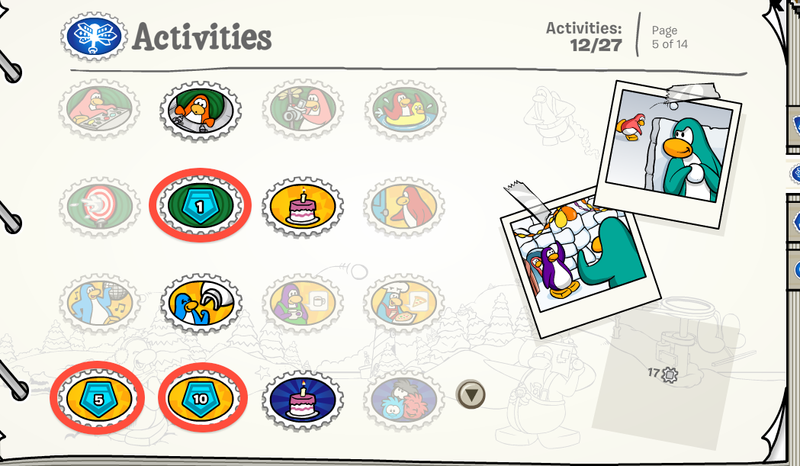 I think it is a great idea that Club Penguin has introduced the Field Op Stamps. Hopefully they will be more popular now! I always spend my medals! So I better start saving! But I was hoping that you just had to complete a few Field Ops to get a stamp rather than saving medals! how did you get ten medals on only one day? hey mimo. check this out. The Fair is finally here! We're seeing a lot of you playing mini-games like Feed-A-Puffle. Some of you may have noticed a stamp in that game. Don't forget to swap the tickets you earn for prizes at the prize booth! Make sure you redeem your tickets before you log out so you don't lose them. No, not like that. You save up ur medals by not trading them for elite gear and you gotta be patient until u have completed 10 field-ops. Well Mimo has made the past Field-ops so he got all the medals. 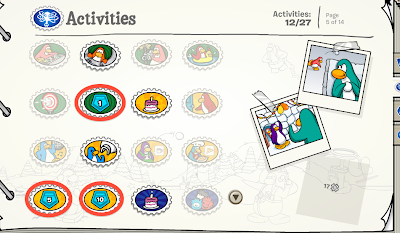 i dont care bout the epf stamps cos members can make up those stamps with the games we can play! Just stand in a booth and use the food emote for it! e.g. Go to the cove and step in side the popcorn carriage. then use the popcorn remote. i have a glitch,put on brown colour,then put on a green jacket,then clown boots,then dance,and what do u see? ur wearing a colour thats not available yet! isnt that cool also everyone can see the colour and ur boots will turn into sandals! 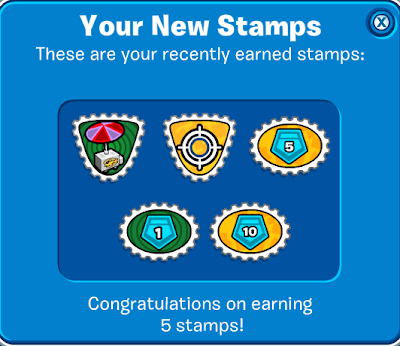 i actually emailed cp about why only the ones of us that didnt spend ours got them and they emailed back replying that the stamps were glitched just like the recycle button on the post cards, anyone else notice this? they said they asre experienceing a few bugs and are working to fix it soon. so you will all get your feild op medals soon. go ahead and spend them because you will get the stamp for the feild-ops you complete and not the ones you save very soon.